Justin ****: "Super fast delivery and grips awesome." Alex ****: "Warm hands now thanks to the hot grips. Thanks." Stuart ****: "Great product, quick delivery." Tim ****: "Excellent trader. R & G grips were a treat. Thank you. Tx for the suspension setup guide too." Pat ****: "great supplier, prompt service." Barry ****: "Excellent purchase very happy"
Justin ****: "Great supplier, grips delivered quickly and work perfectly." John ****: "These are great heated grips. Very easy to fit and operate." Bruce ****: "Great stuff, thanks heaps..."
Irene ****: "Excellent easy purchase, very pleased with grips, thank you." Shane ****: "Great dealing with you, thanks for the brilliant service." 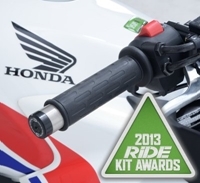 ..
David ****: "Easy, No hassle purchase of R&G heated grips, Highly recommended." ..
Stuart ****: "Great transaction, quick & painless & very quick delivery." ..
Clint ****: "Great supplier very fast and very hot grips thanks A+++" ..